6 unique massages for toning the muscles of your face and smoothing out wrinkles. Do-it-yourself lymph massages for a beautiful neck and chin. Sensible instructions for cleansing and washing. 3-minute moisturizing "lotion mask" to make your skin look fresh and lustrous. Remedies for wrinkles, sagging, oiliness, pimples, blackheads, and much much more! Japanese women are renowned for their beautiful skin, but until now there has been no book in English that reveals the secrets of the typical Japanese beauty routine. The Japanese Skincare Revolution is the first and definitive guide for women of all ages and races who want to have beautiful skin like the Japanese, and don't want to spend lots of money on cosmetics and treatments to achieve it. Chizu Saeki has written numerous books selling over 3 million copies in Japan, but this is her first book translated into English. Having spent her entire career in the beauty industry, Saeki retired from Christan Dior in 2003 with over 600 cosmetic consultants under her tutelage. She now is president of Chizu Corporation, which runs an esthetic salon and beauty school in Ginza, Tokyo allowing her to teach and tour Japan giving demonstrations of the techniques she has developed. Proven Japanese beauty techniques for all people of all ages and skin types! 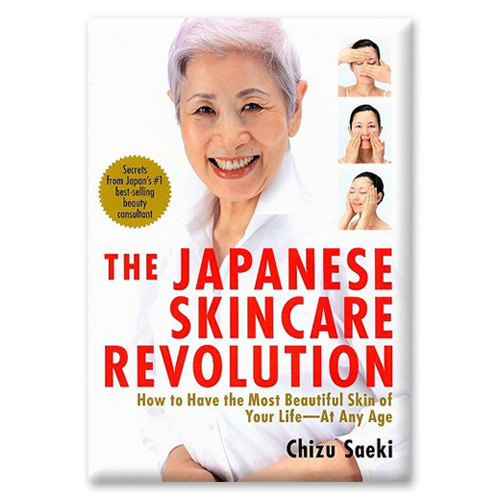 The Japanese Skincare Revolution is Saeki's best-selling skincare title, and her first to be translated into English. A distillation of all of her most essential techniques, it introduces to the reader the lotion maska moisturizing treatment for keeping the skin fresh and lustrous; hand techniques for toning the muscles of the face; lymph massages for draining toxins and improving blood flow; natural, no-nonsense remedies for wrinkles, sagging, oiliness, pimples, and blackheads; warm care and cool care for soothing the mind and body; water massages to energize the skin; and much, much more. You'll soon discover that it's possible to have beautiful skin at any age, without spending a fortune. First US edition published 2012. Read, learn and enjoy having the most beautiful skin of your life!